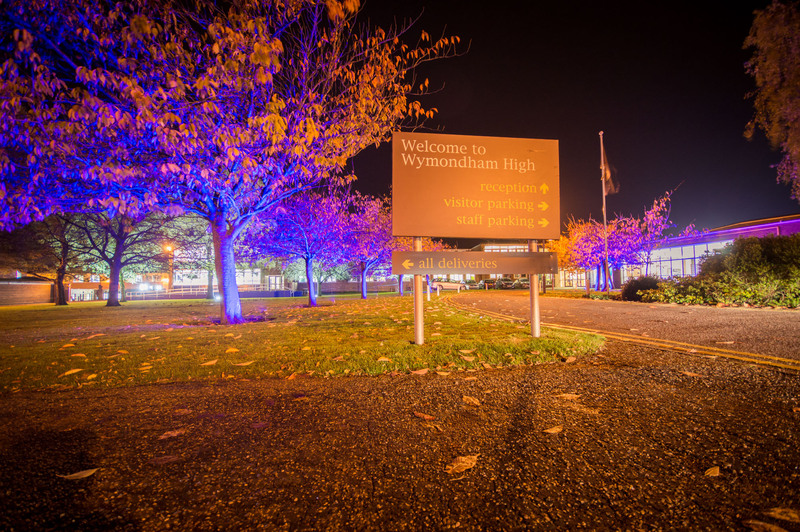 On November 6th 2014 Wymondham High Academy gained Microsoft International Showcase School status, joining five others in the UK and 104 in the world after having been a Microsoft IT Academy for little over a year. What does this mean for Wymondham High Academy and the staff and students? Essentially it means that we represent the cutting-edge of using Microsoft technology in an educational institution. This goes right the way from running Windows Server 2012 R2 on our servers and Windows 8.1 Enterprise N on our 700 desktops and 250 laptops to using 250 Surface RT tablets in the classroom, purchasing Surface Pro 3s for the senior leadership team and offering students at Wymondham High IT opportunities a little ‘outside of the ordinary’ such as experiences of using enterprise social networks in-school such as Yammer and even giving students the opportunity to download 5 free copies of Office 365 Pro Plus and £50,000 worth of other Microsoft software. We are now internationally recognised as worldwide leaders in using Microsoft technology in the classroom to deliver fun, interactive and inspiring lessons and to inspire technological innovation in other educational institutions. Devices such as Surface tablets in the classroom can help students of different ages to learn together and open doors to further knowledge. Part of being a Microsoft International Showcase School is having the ability to recognise that technology isn’t something that should be shunned in the classroom for fear of students being distracted by it. Instead, it is about recognising that technology in the classroom can maximise the potential of students and can provide great learning possibilities and access the wider reading and information to help education. In a world where technology is moving along faster and faster and children are adapting faster and faster to new technology, whether it be smartphones, smartwatches, social media or even virtual reality, technology is something cannot simply be ignored and brushed under the carpet from education. The education system must adapt to using technology in the classroom. Children who began Year 7 (the youngest children at Wymondham High) this year were born in 2002 or 2003, meaning that many of them have never known life without technology around them – most notably a life without the internet and touch-enabled smart devices such as smartphones and tablets is completely alien to them. Children in Year 7 and Year 8 are younger than Windows XP and Office 2003. Although these products are no longer supported by Microsoft, Windows XP still holds a market share of approximately 17% over a variety of devices, such as desktops, laptops and even ATMs, on a global scale. There is a very strong likelihood that there are some schools who are still using Windows XP and Office 2003 to deliver their students an education. 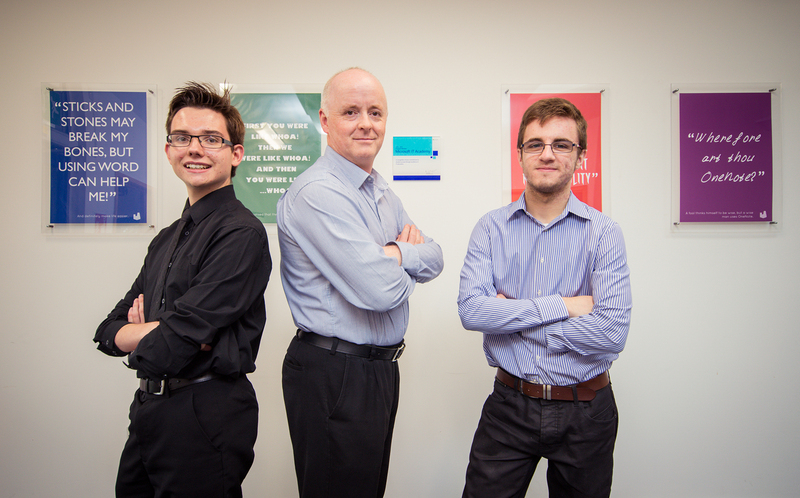 Student Ambassador and A level student, Jason Brown (left), Head of IT Strategy, Kevin Sait (centre) and Student Ambassador and IT Apparentice, Harry Traynor (right). How can you expect students to use software in schools that is older than they are? Especially when what they are used to using at home is in a completely different world. In a Year 7 assembly I presented at Old Buckenham High in October, I asked the audience if they owned a smartphone or a tablet. Whilst a number of them owned a smartphone, the overwhelming majority of them owned a tablet. This is what being a Microsoft International Showcase School is all about. It’s all about adapting to using new technology to teach students to meet the needs of what they are probably used to using already. There will come a point where a child will not know what a desktop is, or know how to type on a keyboard or navigate using a mouse. Instead they’ll be using touch devices all the time. How does using outdated hardware and software in a school support this? The students pick up the new technology extremely quickly. They’re used to using tablets and Windows 8.1 at home so for them it is second nature. The younger students are always the fastest to pick it up, but even the older A level students pick it up considerably quicker than most teachers. 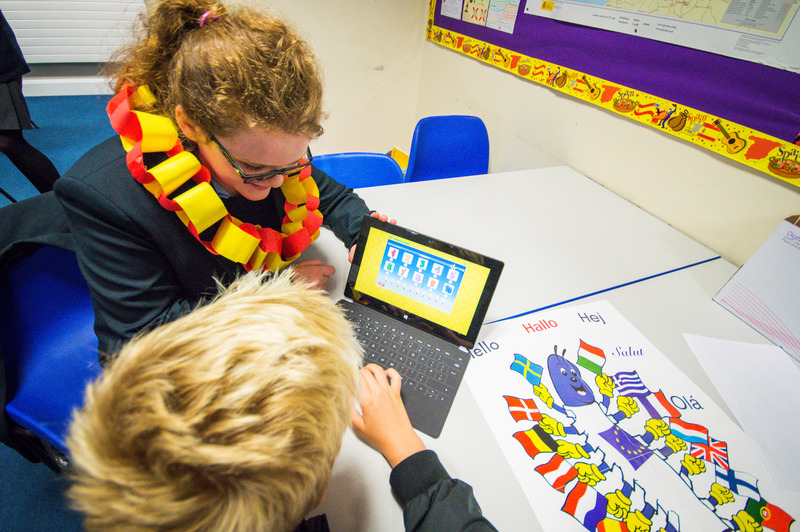 Being a Microsoft International Showcase School isn’t just about getting students using this technology – it is also about getting teachers using this technology to teach. In fact, getting the teachers to use it is the most important bit! Without the teacher support, none of this can happen because at the end of the day, who are the ones planning lessons? Not the students! Teachers at Wymondham High have been increasingly enthusiastic about using technology in the classroom. Many of them have created groups for their classes on Yammer where they can post lesson resources and answer any questions that students may have. ‘The learning doesn’t end at 3 o’clock’, and it certainly doesn’t on Yammer! In fact the quietest times on Yammer are during the school day. After 3 o’clock the network is thriving with both students and teachers posting to take the learning outside of the classroom in a fun and modern way. The students enjoy using Yammer so much that teachers have been setting them homework to do on Yammer and the students aren’t even aware that they are doing the homework. The students love Yammer because it is just like Facebook. ‘Finally!’ they all thought as we unveiled Yammer in IT lessons, ‘we can use something like Facebook in school!’ It must’ve been a dream come true for many! 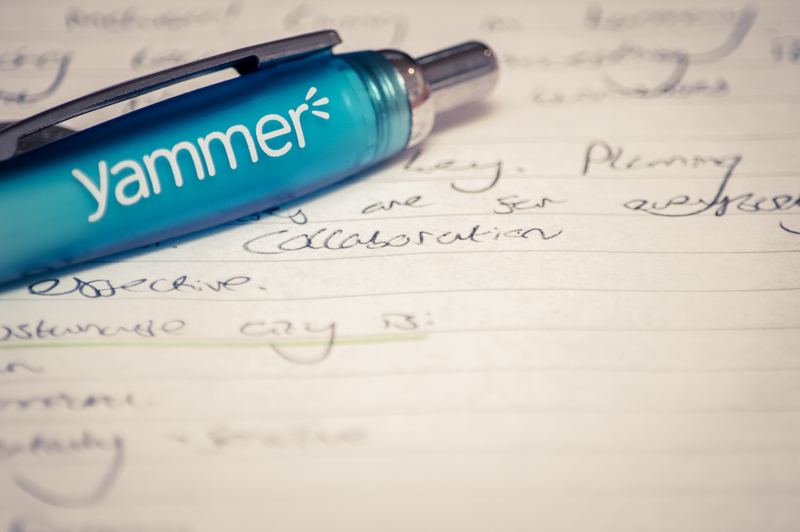 Yammer teaches students the skills of the future: collaboration and etiquette on social networks in the safety of Wymondham High are two key things it teaches. Yammer works on a two-way basis however. We have well over 1,000 members on our Yammer network and this time next year we will definitely have all 1,800 members of the school on there. I can almost guarantee it. In fact, I can almost guarantee that we’ll have all 1,800 members on Yammer by April next year. Having such a vast network means that there is scope for the odd person to misbehave: whether that be posting inflammatory remarks, creating inappropriate groups or just downright spamming the network, we need a team of admins to monitor the network and ensure it all runs smoothly. Student involvement is a key component of the International Showcase School programme and so we have several students, including myself, who are admins on Yammer. This gives us power to delete posts, groups and also to remove users (among many other things). This has given those students who show maturity and responsibility an opportunity in learning how to moderate social networks and dealing with those who ‘break the rules’ online. Which leads to key life skills such as taking responsibility and action where needed. But do you know what? We currently have 1,100 users on our Yammer network and in the past year that it has been open for members of Wymondham High to use, we have flat-out banned very few people. Less than ten people have received any kind of ban, whether it be a permanent ban or a temporary suspension and only a couple of people have been permanently banned from the network. Those who do get banned usually own up to what they did and are allowed back on and act more maturely. Above all, this shows that the students are using the network correctly and in the right manner. Yammer teaches all the students etiquette on the internet (‘netiquette’) and teaches them about using social networks safely and responsibility in the safety of school. 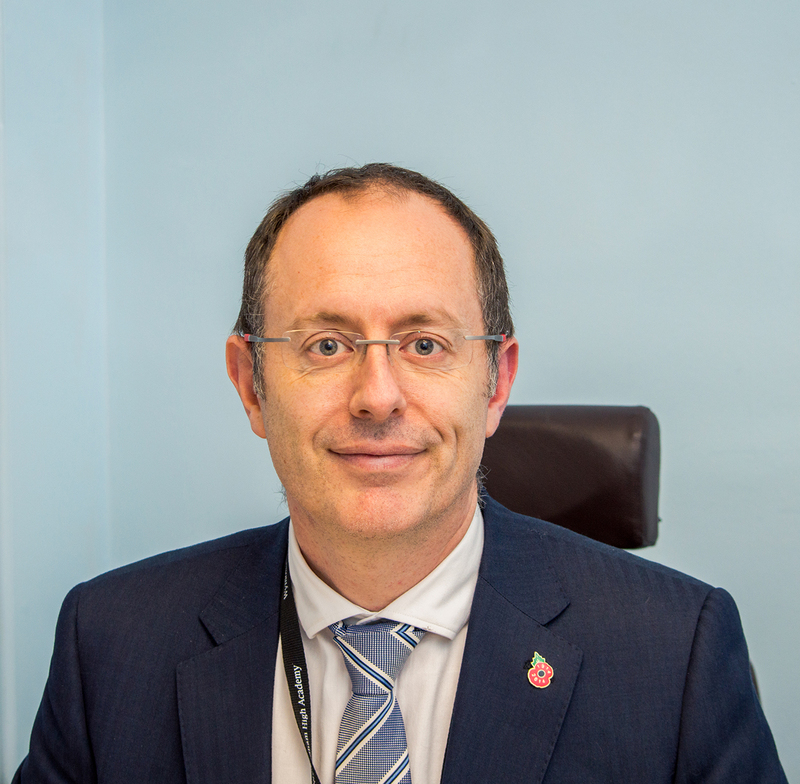 Principal of Wymondham High Academy, Russell Boulton, is also passionate about using Microsoft products such as Yammer, OneNote and Surface tablets in his lessons. At first many teachers were unsure about Yammer and hesitant to use it, presumably because they were unsure what it was useful for and because of all of the cyber-bullying stories you hear in the press, but once it had been explained how it could help student learning, popularity exploded and once some teachers started using it, like a set of dominoes, the others followed suit. Principal Russell Boulton has been a keen user of Yammer and OneNote for his science classes who love using the technology to learn. Over the past few months he in particular has been a teacher who has lead the way forward in using Microsoft technology in the classroom. It is also great that he is the Principal and so is the teacher whom the other teachers look up to. Teachers have also been talking to each other on Yammer about lesson planning and asking each other for lesson ideas in their ‘Teaching & Learning’ group on the network which now has 160 members. This means that the domino effect has further been enhanced. I think one thing that teachers feel Yammer is great for is security. On a social network like Facebook or Twitter or even on internet forums, anybody can join and start talking to you. This means that you don’t always know who are you talking to. The beauty of Yammer is that only members of Wymondham High can join our network – the requirement to join is a valid WH-AT.net email address (which is our school domain). This means if any cyber-bullying does go on, we know that is from somebody in school and not an outsider. Security is further enhanced with a very, very long ‘monitor keyword list’ which flags any inappropriate words in messages and reports back to Kevin Sait. This kind of security is what has helped Yammer take off in our school and helps to make it to a safe network to communicate on. The same story applies to the Surface RT tablets. At first, they were hardly used, but once it was apparent how handy they could be for writing essays in class, researching information in class and generally how portable and convenient they were, popularity exploded and now it’s difficult to find a time when the tablets are not being used! Surface tablets are extremely popular in lessons at Wymondham High, whether it be maths, geography or science. Increasing numbers of students in the school also leads to a shortage of IT rooms, so the Surfaces make a great and convenient alternative. We also encourage students to bring their own devices to school to work on, whether that be a tablet, smartphone or laptop of their choice. They can of course install Office 365 on this device thanks to Student Avantage, save work on OneDrive, and access it on school computers and on any other device. 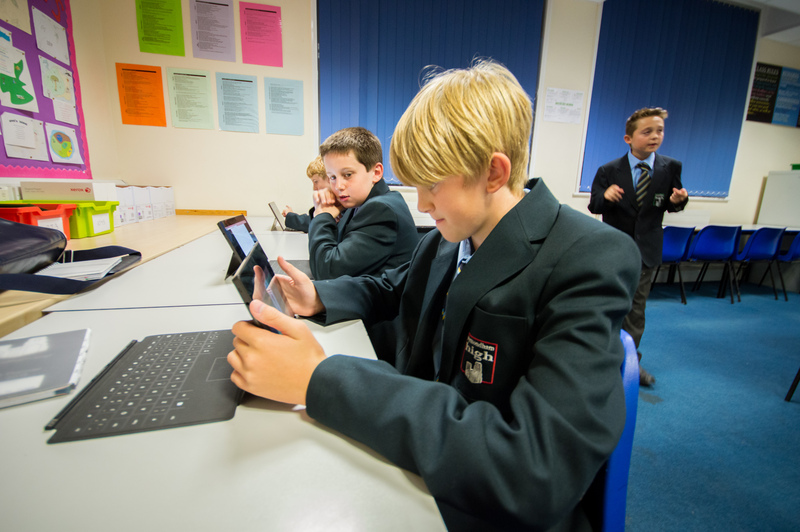 These are just a few of the ways in which teachers and students are using Microsoft technology at Wymondham High to inspire innovative learning. Another part of the programme is to assign two Global Student Ambassadors. These are students who are passionate about Microsoft technology and will promote it in the classroom and school, but also at large Microsoft Educational events. I am very proud to announce that I am one of Wymondham High’s Microsoft Global Student Ambassadors, and Harry Traynor, an 18 year old IT apprentice at Wymondham High who has been involved with the Microsoft IT Academy project at Wymondham High since day one, is the other. I am a 17 year old student currently studying A levels at Wymondham High, but have been attending the school since I was 11 in Year 9 (and Harry has been attending since he was 11 in 2007) and we have both seen massive, massive changes to the IT systems in school over the years that we have been here. 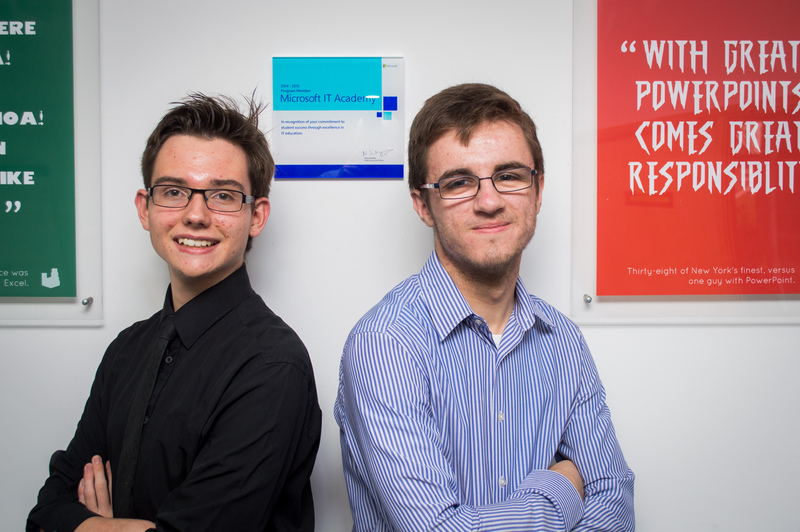 Worldwide Microsoft Student Ambassadors for Wymondham High, Jason Brown (17, left) and Harry Traynor (18, right) are of course passionate about technology in the classroom. We are extremely proud and privileged to have worked with people like Kevin Sait who are real inspirations to us to have reached where we are standing now. To have a Worldwide title at the age of 17 or 18 and be personally known to without a doubt, the largest software vendor and technology company on the planet is absolutely incredible. And there will be without a doubt students at Wymondham High who in the future will hold this title at a much younger age than Harry or I. The ultimate aim is to provide a learning environment in which technology is used by students and staff to its absolute potential and creates successful learning and engaging teaching. We are preparing children for jobs that don’t exist in our economy yet. Most of the jobs in IT that these children will eventually end up doing do not exist yet – so we need to teach them the skills that they will need. Microsoft Office skills rank in the top 3 of 20 skills desired by employers, and skills such as entrepreneurship and collaboration are often thrown around as being ‘future life skills’ required to work in a connected and digital place of work. students who are there. ‘I live and breathe this school’ is how I put it to an IT teacher the other day, which is why I am so proud to represent my school’s technological achievements on a worldwide scale. Using technology in the classroom makes for successful learning and engaging teaching. Pictured here is IT teacher, Mr Howard, teaching coding. We lead, we inspire, we innovative, we educate. We are Wymondham High Academy: An International Microsoft Showcase School. Tablets and Windows 8.1 – a changing world. ‘O’ Team Ventures is here !